I am pleased to announce that, starting on September 1, 2013, a new coach will be joining our BBTA Coaching Staff: Coach Yee Tantiyavarong! 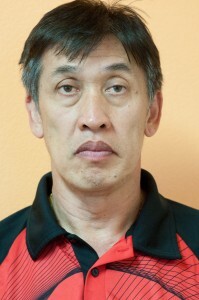 “Coach Yee” has been a well-known coach here in the Bay Area for over a decade. He also actively participates in National Tournaments till this day. Welcome to the Academy, Coach Yee! Congratulations to our young athletes! Congratulations to our Academy Winners! The Academy on CW 44/Cable12! Bay Badminton Center and the Bay Badminton Training Academy was covered in a feature by the new TV show, WhatSF, on the network channel CW (44/Cable12)! There are no classes for BBTA from December 24th to January 3rd of 2013.